Fort Erie season ready to begin on Saturday. Former top Fort Erie jockey Francine Villeneuve has retired, and Neil Poznansky moved his tack back to Western Canada. With only 9 million being offered in purses, which means only around a 510,000 per race average, it will be tough for a jockey, or jock's agent to make a reasonable living. MTR launches RacelineBet.com Free service, which includes replays. Available in 37 states. I'm going to try to sign in today to see if I can at least access the free replays. I doubt I will be allowed. Update: I need an American address to become a member, just as I thought. Here is a link to the site. Bill passes allowing slots at Indiana racetracks. Woodbine Bias Trends Early speed is still king. It makes horse racing pretty boring. One good thing though, the time it takes to load horses has seemed to lessen in the last two weeks. I wonder if they are doing things differently. Bill Finley Preaches To The Choir: "Reduce Track Takeouts"
"slots have done nothing to promote the sport, create new fans or level the playing field for horseplayers who are playing an unbeatable game. Fix the latter problem and horse racing could enjoy a remarkable revitalization." "(horse racing) is a gambling enterprise that is so difficult to beat that virtually everyone who tries it loses money. The situation has only grown much worse over the years as tracks have raised takeout rates"
"what if racing were transformed into a gambling game that no longer caused customers to go broke but actually made the most savvy players wealthy? Because of slot machines, that's no longer a preposterous scenario." "(thanks to slot machine revenue) the amount of money that trickles in from what people are betting on horses is virtually meaningless." "Imagine a game where there was no takeout or a very small one. The same exacta that is now paying $40 would pay $50. The winner that now returns $8 would pay $10. The result would be a true game of skill in which the best handicappers would defeat the weaker handicappers and make money. And even the poorer handicappers wouldn't get buried, which is what is happening to them now. The best analogy is poker, where the house only takes a very small cut and the rest is returned to the players. The good poker players win and the bad ones don't. The fact that poker is a game where a smart player can make money is obviously a major reason why it is so popular." Without repeating myself, I did a post a few months ago offering the same advice to the racing industry. Read it here. I expand on Finley's thoughts and give reasons why I think the track will win out big time if they adopt my ideas. Stem cell therapy starting to emerge as a viable option for injured thoroughbreds "So far, more than 500 horses have been treated by VetCell and clinical follow-up suggests the technique doubles the chance of an injured horse returning to full performance." Canadians lost 14.5 billion gambling last year. Lost money, at least was injected back into the economy. CPMA prohibits drug Resocortol. It is an anti-inflammatory for canines, that was just approved by health Canada for use by vets. As expected, Barney Frank introduces bill to try to get internet gambling legalized in the USA. I can see Vegas companies running the show. I've been brutal lately with my Woodbine Picks. But I was always told to get back on the horse. Today I like Executive Flight in the 2nd, Herb Engagement in the 4th, and longshot Salty Silver Sally in the 9th. Barney Frank to introduce a bill, on Thursday, to lift the internet gambling ban in the US. Push for Instant Racing in Ohio. Since slots are not allowed, Instant Racing could be a viable alternative to help save racing in Ohio. Unlike slots, Instant Racing is a skill based game. Instant Racing has added nice purse money to Oaklawn race since Arkansas allowed the game to be installed at racetracks. Places like Fort Erie and Windsor sure could use something like Instant Racing. With high vet bills, it has become increasingly harder to be an owner in either the thoroughbred or harness game. I think Ontario should allow 24 hour Bute and limit legal drugs to around 5. As expected, Malakoff disqualification upheld Malakoff was the best horse in the race that day, but interference is interference. FasTrack has both a harness and thoroughbred format. It is a race program that helps introduce novices to gambling on horses and a great way for racetracks to help market their product, especially to the "company" dining room crowd, who are usually very intimidated the first time they go a racetrack. Keeneland Polytrack Has Changed The Style Of Racing There. It Now Resembles European Grass Racing. This leads to extra unpredictability. Not good for the handicapper. Woodbine still seems to favor speed, and riding styles haven't been changed that much by the new track. Why Does It Take So Long To Load Horses At Woodbine? More on the guy who shot himself inside the Seneca Niagara casino. Canada mentioned as being more progressive when it comes to problem gamblers. Canadians gamble for the fun of it more than they do for the money According to survey. What is with the amount of delays Woodbine patrons have to live through just to watch a race at Woodbine? I watch races from all over, and I just can't get over how long it takes for the gate to get loaded in many cases at Woodbine compared to other venues. Does the gate crew get paid for the amount of time they are on TV? They would be rich men if that was the case. Kidding aside, I wonder if it is that Woodbine runs a very high percentage of maiden races in comparison with other tracks around North America. But whatever the reason is, something should be done about it. I'm tending to think that their rules are too lax when it comes to schooling in the morning. There are too many hesitant horses in the afternoon. Also, horses who have been off for over 3 months should also be forced to pass a schooling test in the morning too. Often, horses who have had 3 months off, had some sort of injury prior to the layoff. This might make them hesitant to load whenever their next race is. I can't believe how bad Balachour Prince bounced yesterday. I know the rail has been hot the past two days, but that can only be a partial excuse. Ramsammy and Silvera teamed up for 3 wins yesterday. I did select all three as first choices, but I admit the 2 furlong race was complete luck. They hook up again in the first race today with Kris's Honor. It is another 2 year old first time starter race so who knows. Kris's Honor was bought for $1,000. What gets me is starting $500,000 purchases in 2 furlong races, like what we saw yesterday with Sarcasm. You don't find too many 2 furlong race winners to do anything beyond 5 furlongs. These kind of races ruin most horses for life. In the second today, a maiden 3 year old race for a $60,000 purse, only 6 horses were attracted to it, and 5 of them are first time starters. At 8-1 in the program, firster Pepe The Barker is coming out of a great workout on a dead track. Expect long loading delays in the first and second races, despite the small fields. Summer Girlfriend could pay a good price in the Whimsical in today's sixth race. Thoroughbred horses are being shipped to Canada for slaughter. Blech! If this is true, and I think it is, it needs to be stopped yesterday. Youbet gets approval to buy back $10 million in stock. In the first today I like the exactor box of Samarcos and Mystic Missile. In the fifth I like Lookofaneagle to double up off a nice maiden breaking win April Fool's day. Throughthickandthin might be a nice price in the 7th, but may need this one (no works over 4 furlongs). Tomorrow, I like Kettle Rapids in the first, Pete's Wonder again in the third (just missed last time), and Balachour Prince looks like a cinch in the 5th (lets see how Lookofaneagle does today first). I like Twisted Wit to be right there in the Jacques Cartier. He really likes 6 furlongs on the Woodbine Poly. Penn Gaming considers buying Wonderland dog track in Massachusetts; thinking the state will allow slots soon. *Odds Grid: +850 means that a $1.00 bet would pay out $8.50 or a $100 bet would pay out $800. Which character will be the 1st to get "whacked"
If I had a gun to my head, my pick is Corrado, because Tony will be indifferent to it, but will still have to deal with it. Not too sure what is going on at Woodbine with regards to the times of the races. track variants now for close to 30 years, and there was something definitely different the past weekend. The only time that I've seen this kind of weird behavior regarding times, is when there is a strong wind. Based on what I know, the problem is with the 5 furlong races. It is doubtful that the track between the 5 furlong marker and the 7 furlong chute is a paved super highway, while the rest of the track is playing slow. Are the 5 furlong races actually about 5 furlongs this year? Are they starting the timer earlier this year?, because usually there is a running start before the timer actually starts, maybe the timer is starting when the gate opens. I could investigate this further by watching some replays at Cal Racing, comparing last year to this year. Last year, when the Polytrack was installed, there were two slow days, with my 5 furlong variants being 9 and 10 fast (using my variant system). Most days, the average variant was around 16 fast for 5 furlongs. are on par with the variants I had for last year, maybe 1 or 2 points slower on average tops. US Department of Justice forced Neteller out of Canada? It looks like Neteller cut a deal with the DOJ. Money laundering coupled with Americans using Canadian addresses have caught the DOJ's eyes. There doesn't seem to have been any Canadian government pressure that caused Neteller to stop doing business with Canadian on-line gamblers. inappropriate for us to continue accepting online wagers from Canada." frozen on April 13th, so they better get their monies out before then. Prince of Wales appeal verdict due soon I saw the race many times, and Malakoff was definitely guilty of interference. Thistledown season to begin shortly, still no slots and this means crappy purses. Owner of claimed horse sues previous owner and his trainer, Mandella over nerve removal operation Another improvement that could be made to horse racing is that all procedures that cost more than $200 should be reported by the vet and the trainer separately (to keep them both honest), and then it should be reported on the horse's form for the public to see. It is good for the bettor, and good for the potential claiming owner. Horse racing needs way more transparency. Anytime a professional athlete sprains a pinky, the info is available to the public. Yesterday at Woodbine, the rail wasn't so hot, but it wasn't horrible either. The first four winners had two 5 furlong workouts. In the 2nd, Holy Wings should fly home. The "Babe" has a hot mount in the fourth, Jade's A Pleasure. Winter raced Rice Pudding could be very tough in the 5th. And in the 6th, Bold Thing has a winter raced edge as well. UPDATE: Man shot himself in the chest at a blackjack table at 10:30 this morning. He died of his wounds. Early speculation is that it was not gambling related but the victim had personal problems. Robert and Daniel Waxman being investigated by ORC over hidden ownership. Penalty will be large if found guilty. Stated that the numbers were consistent with birthdays and dates. My question is, did he play those numbers previously and does the lottery system have the capabilities to trace these things. Willmot feels like a dope? Picks for Woodbine on Friday. If you like maiden filly races then Woodbine is the place for you on Friday. Five of 9 races are of that profile. Not my favourite races. In the 4th I like Moon King. In the 6th, the exactor box of Neon Strokes and Moonshine Miss looks appealing. In the 7th, Piece of the Pie looks best, with hot (2 for 2) jockey Richard Dos Ramos aboard. Dos Ramos will be winning at less than 10% by the end of the year. Why is Woodbine so gosh darn fan unfriendly? They seem to be the only major track in North America to either not have them for free at their site or at least available at RaceReplays. What are they trying to hide? I know it seems that when Todd Kabel wants the lead, he usually gets it unchallenged magically (at least until midway through the far turn, nudge, nudge, wink, wink. They aren't hiding that are they? Anyway, there is a way to get most of Woodbines race replays for free. Go to Cal Racing and join for free. Now you can't do a track search and expect for Woodbine to show up, but if you look up horses by name, you can catch Woodbine races....at least for the time being. I just got wind that a Candy Stripes mare is for sale. Halo's Glow isn't in foal, but apparently that isn't an issue. The asking price is $20,000 US. The price went up that to the victory of Invasor. Her 3rd dam is a full sister to Secretariat. To avoid the penalties, the US would have to either permit Americans to gamble over foreign-based sites or eliminate exceptions for off-track betting on horses, including over the internet, as permitted under the 1978 Interstate Horseracing Act. ORC announces HIP (Horse Improvement Plan) review has commenced Ontario has always rewarded the allowance state bred horses but what is needed in Ontario to improve breeding is state bred or Canadian bred claiming races. This will increase the value of the "cheapest" horse. Almost every other jurisdiction has state bred claiming. It is a great out for those who breed or buy Ontario horses. They should write $5,000 and $10,000 state bred claiming races at Fort Erie, and $20,000 state bred races at Woodbine. They should give it a try. Start with open and non winners of three races. 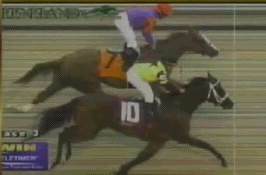 Invasor Wins The Biggie In Dubai In late February, Invasor's dad, Candy Stripes, died of colic at 25. He sired 10 champions. Veteran trainer Don Campbell dies at 61 He specialized in horses that could go a mile and a half. Everyone knows that race horses all have a universal birthday on January 1st, but very few people know that horse players too have a universal birthday, and it is April 1st. I'll be celebrating by watching races at Woodbine from home. Yesterday was opening day at Woodbine. Keeping in mind the well publicized problems with the Polytrack, there was a large rail bias and a pretty good speed bias. Forget about coming from the clouds on the far outside....at least yesterday. I wonder if the trend will continue today. I can't see them doing anything drastic to the track until the warmer temperatures come along in the next 4 weeks. Trainers that look like they have their horses ready are Carrol, R. Armata, Tiller, Baker, and Katryan. Today, Bear Bullet Too should be tough in the 3rd. Redifusion in the 5th, has a tough post but looks miles the best in a hidden way (8-1 in the program). Another winter raced horse, Gold Spark, should be one two in the 6th.